Cambro introduces a small accessory to its warewashing line –new ID clips for Camrack glass racks. Although these clips may be small, their function is enormous, showing greater benefits the larger the size of the operation. So what are some of the ways this clip may benefit? Instead of pulling each rack out to visually see what type of glass is in there, the new Camrack Extender Clips allow operators to identify glass rack contents at a glance. They allow the warewashing area to stay organized. NO need to label stacks of racks with wall placards that may become obsolete as people move stacks of racks around. The ID clips stay with the product so no matter where the racks are moved, operators can be assured the right contents and ID match up. If ever the rack contents change, simply use the same rack but change out the ID clip. This saves a lot of money for the operator by not having to replace glass racks. There are 34 pre-printed clip designs that you can select to suit your needs. These designs show the name of the glass as well as an image of the glass so workers unfamiliar with the name can easily match up the right glass to the right rack. Blank clips are also available to identify your one-off contents by using a Sharpie. Personalized clips can also be ordered to cater to your needs. Clips are highly durable and safe with the high heat and chemicals from commercial dishwashers. Clips can be attached instantly and quickly! While the warewashing area of any foodservice operation is often overlooked, it can in fact impact the labor expenses of the operation. By no longer wasting valuable resources to sort out glass racks and by providing neat and organized inventory management, the new Camrack Extender ID Clips will offer time and labor savings many times over its weight in gold. 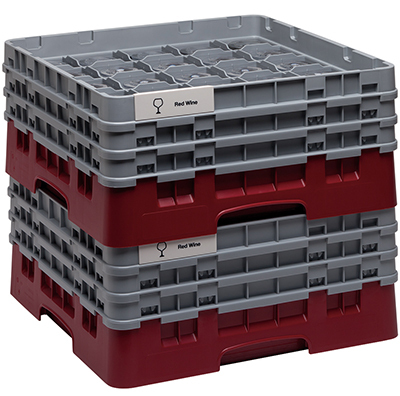 Learn more about Cambro’s ID Clips here! Introducing the NEW Camshelving® Premium Series Dome Drying Rack!